In 1950 the first meeting of the merged societies, ASXRED and CSA to form ACA was held at Penn State and many of the American members saw fit to come early to attend a special meeting arranged by Ray Pepinsky ... This was an especially impressive event partially because of the computers Ray had on display and fully in operation but also because of the rank and fame of the audience and speakers. Almost all noteworthy US and Canadian crystallographers attended as well as many from overseas (several of whom were already there working with Ray). from Crystallography in North America (1983), edited by D. McLachlan Jr and J. P. Glusker. New York: American Crystallographic Association. 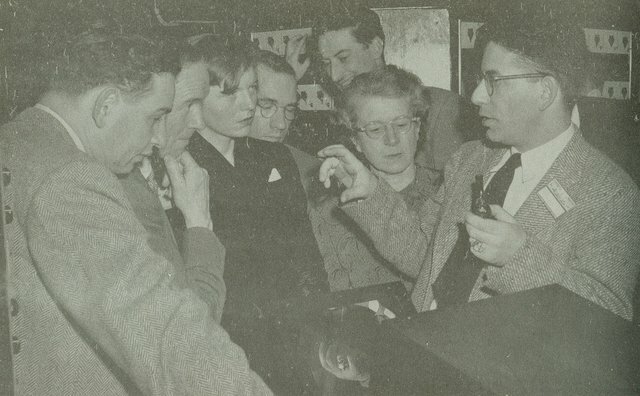 Ray Pepinsky explaining the X-RAC analogue computer system for Fourier syntheses and display of contour maps. 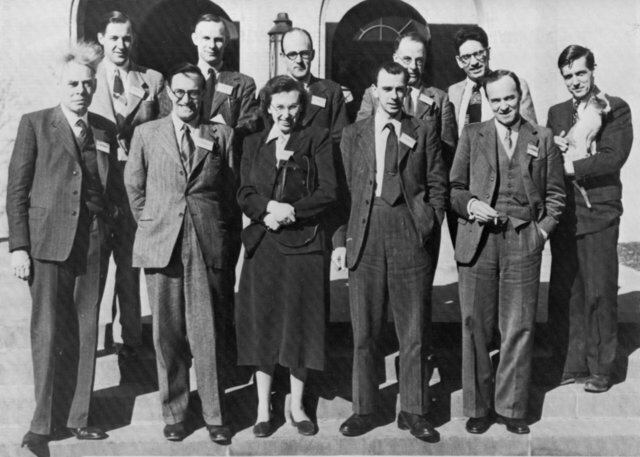 Left to right: I. Fankuchen, J. M. Robertson, Low, Hughes, Friedman, D. Wrinch, R. Pepinsky.